Public relations practitioners need three bedrock skills to build targeted, purposeful relationships online. Being where your important people are. The people talking about you, or the people you and your brand are trying to reach. Google+ is a social media platform. A destination. But it’s also a social layer. A wrapper covering all Google’s other products: Gmail, YouTube, photos and, of course, search. The relationship between Google+ and search is particularly important because anything posted to the network gets indexed by Google. And, according to Statistica, a statistics portal, 88.1% of global web searches were made through Google in January 2015. So, with search indexing in place, the next challenge is to build social signals through engagement. This means doing your best to ensure your content is consistently rated (+1 is the equivalent of a Like on Facebook or Favourite on Twitter), shared and commented on. If you want to learn how to create visually engaging posts take a look at Dustin W Stout’s post The Anatomy of a Perfect Google+ Post. Here I’m going to focus on showing you how to build a community by identifying and nurturing online relationships with relevant people. Whether in personal branding, working for our employer or clients, we’re on the lookout for relevant people who chime with our content. 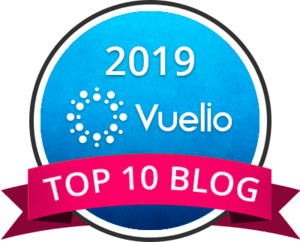 People who engage with it enough to +1 it, to leave a comment on it, or even to like it enough to pass it on – sharing our content with their own followers. Building engagement with relevant people is a key element of Google+ it makes sense to start by building a relationship with the people who are already interested in you. I use Circloscope for this. It’s a Google+ circle management tool. 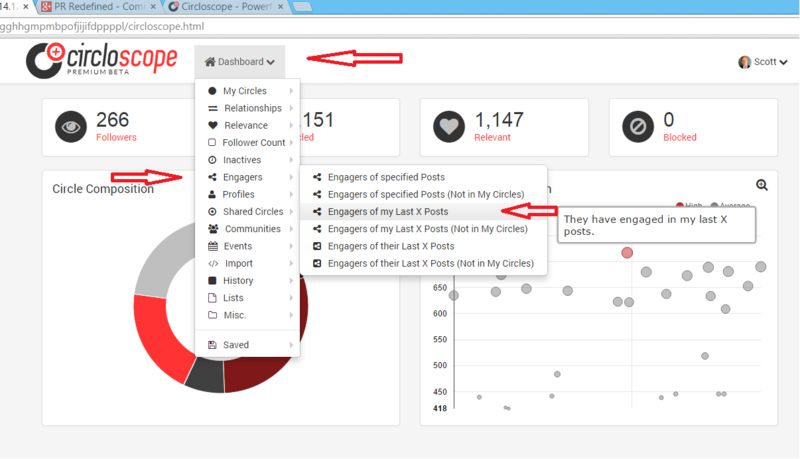 Firstly, set up an account with Circloscope and link it with your Google+ account by downloading the Chrome extension. There is a free option with an upgrade available for $47 a year. The upgrade allows you to do bulk actions; helpful for quickly adding groups of people to new circles or unfollowing people who don’t engage with your content. I’m keen to find out who has been engaging with my most recent posts and what that engagement looks like. 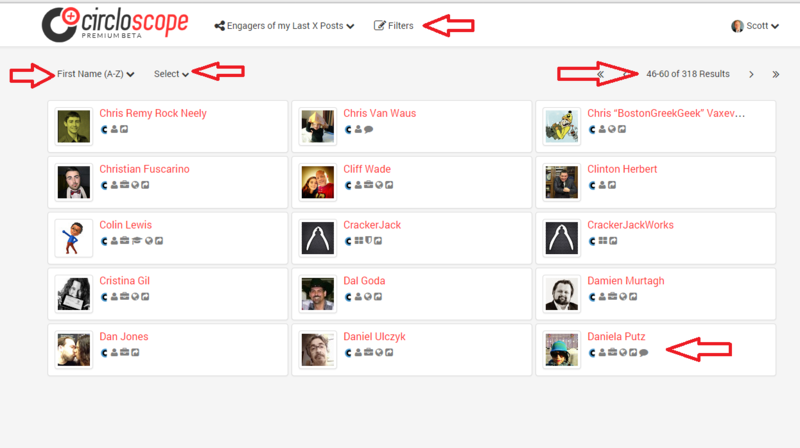 Click on the drop down ‘Dashboard’ menu and select ‘Engagers’. Then select “Engagers from my last x posts”. On future searches I could be more specific and only choose people who are already in my circles. 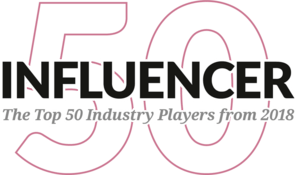 I’ll show you at end of the post how you can borrow trust and authority from industry influencers, by adding the people who engage with their content to your circles. Next, select how many posts you want to find engagement on. You can check as many as your last 40. For this search I’m only going back as far as my last five posts. Deep search pulls up all the reshares of your post. The search on my last five posts shows that a total of 318 people interacted in some way. Results are sorted first name last: name by default, but you can change this with the drop down menu and make a selection based on how active the person is on Google+. Alternatively you might prefer to order the selection based on their popularity – i.e. how many people have them in their circles. has both commented on and shared at least one of my last five posts. Using the drop down menu at the top you can filter the engagement analysis further and focus on only those people who have shared, or commented. Doing this shows 266 shared my last five posts. With the most recent engagers targeted I can now set up a new circle with just them in it. The circle is like a list on Twitter. I can check out their stream separately from other streams and try to foster closer relationships with them by engaging with their content. A little while ago I promised I’d show you how to find people who are engaging with industry leaders. If this industry heavy-weight is in the same field as you this is a quick way of identifying people who may be interested in your content, too, and then setting up a separate circle from which to build rapport with them. Follow the steps we first went through to find engagers on my posts, but instead of opting for ‘engagers of my last X posts’ opt, instead, for ‘engagers in their last X posts’. Then select the profile url for the person you want to find engagers for. Here I’ve used Guy Kawasaki and limited the number of posts to the last 20. The results comes back with over 3,000 engagements so I could then prune by shares or comments for instance. This article is was written for My #PRstack: a practical guide to modern PR tools and workflow. The free ebook gathers case studies by public relations practitioners exploring modern aspects of public relations practice. Set across 18 chapters contributors explain how to use more than 40 tools for better public relations, content marketing and search engine optimisation. Launched on 21st May the book was downloaded more than 2,000 times in its first week. 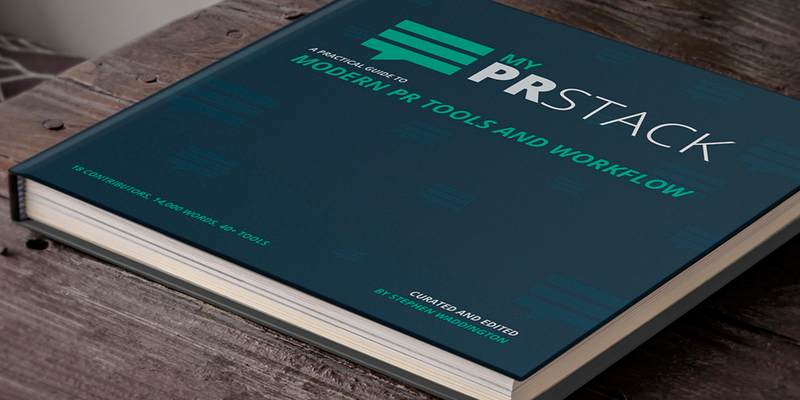 The PR tools are taken from #PRstack – the crowdsourced PR tool directory which houses over 250 PR-related solutions. Many of which are free or have free entry-level versions.